The damaging March 11, 2011 Tohoku earthquake caused significant tsunami waves that were recorded on videos by eyewitnesses. 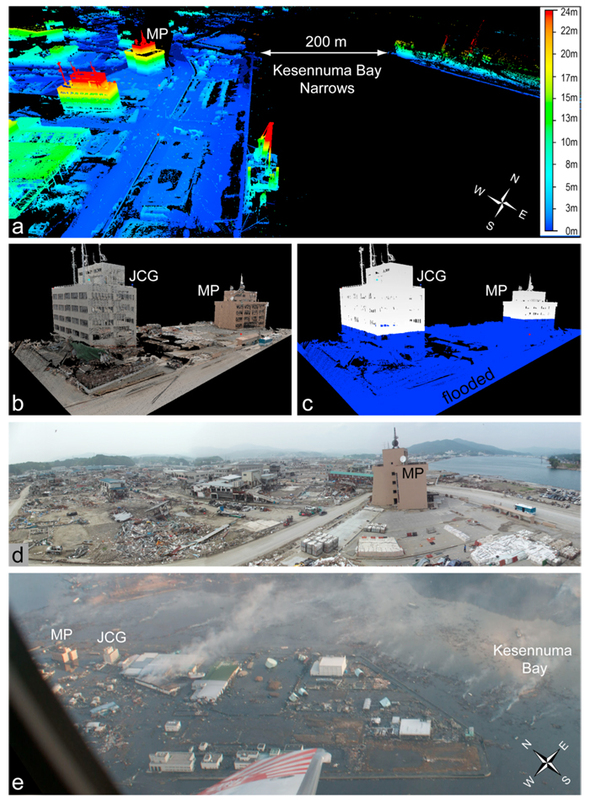 Two survivor videos from building rooftops at Kesennuma Bay were combined after the catastrophe and compared with on site terrestrial laser scans, using ground-based LiDAR. The LiDAR point clouds were used to place the video data into terrestrial reference frame coordinates. Analysis led to an estimate of a maximum tsunami height of 9 meters between the buildings followed by maximum tsunami outflow currents of 11 meters per second within 10 minutes of the tsunami reaching its maximum local height. Inside the navigation channel the outflow was faster than the inflow measurements highlighting the dangers of the receding wave. A great moment magnitude 9.0 earthquake struck off the coast of Japan on March 11, 2011. It was one of the largest earthquakes ever recorded and caused significant shaking and damage. The earthquake produced a series of massive tsunami waves that were concentrated along low lying coastal plains in the Myagi, Iwate, and Fukushima prefectures. The 2011 tsunami reached maximum measured runup heights of about 40 meters at several locations to the north of Kesennuma Bay along the Sanriku coast between Ofunato and Miyako. Two surveys were conducted at Kesennuma in April and June of 2011. The initial rapid survey focused on perishable tsunami high-water marks such as runup height, flow depth, inundation distance, deposition or erosion, structural damage and interviews with eyewitnesses using established protocols. Watermarks of maximum local runup were surveyed using GPS and a laser range finder referenced to the geodetic network of the Geospatial Information Authority of Japan. The second survey in June involved terrestrial laser scanning (TLS; also called ground-based Light Detection and Ranging [LiDAR]) at 3 sites in Kesennuma: the Japanese Coast Guard (JCG) building, the fish market vertical evacuation platform (Miyagi Prefecture building - MP) and a downtown street viewed from the evacuation platform. The TLS was augmented with digital photography to add true color to the point cloud images and integrated with GPS measurements to reference the thousands of points with the International Terrestrial Reference Frame. The TLS images with photographic true color show the two buildings in the aftermath (Figure 2b) and flooded with the maximum water level from the tsunami waves (Figure 2c). 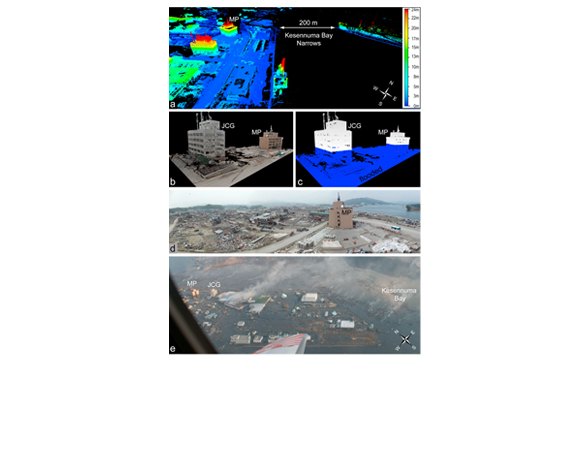 The TLS images provide exquisite and accurate fully three-dimensional recordings of the tsunami aftermath and topography as can be seen in comparison to photographs (Figures 2d and e). The TLS images have a huge advantage of being spatially referenced to the three-dimensional Earth so that not only the local tsunami wave height, but the tsunami surface current and flooding velocity can be determined using the rectified eyewitness videos. Video analysis shows an initial drawdown of the water level in the bay by about 3 meters followed by 12 minutes of flooding at an average rate of 1 meter per minute. The tsunami wave reached its maximum local height of 9 meters after the 12 minutes of inflow. Interestingly, the surface water currents are close to zero (i.e., essentially stagnant water) at the maximum wave height as the flow reverses from inflow to outflow. Then the tsunami wave flows back out into the sea with great force and it takes 7 minutes for the maximum wave height to drop down to the level of the seawall (about 2 meters). The maximum outflow current of about 11 meters per second occurred about 10 minutes after the tsunami wave reached its crest and the current outflow inside the navigation channel jumped from 3 meters per second to 11 meters per second in about 2 minutes. The rapid outflow and quick jump to high current flow highlights the significant danger and destruction caused by the debris laden outflowing wave; a factor that should not be overlooked when considering preparedness and response to tsunami hazards. Fritz, H. M., D. A. Phillips, A. Okayasu, T. Shimozono, H. Liu, F. Mohammed, V. Skanavis, C. E. Synolakis, and T. Takahashi (2012), The 2011 Japan tsunami current velocity measurements from survivor videos at Kesennuma Bay using LiDAR, Geophys. Res. Lett., 39, L00G23, doi:10.1029/ 2011GL050686. Copyright 2011 American Geophysical Union.